The LifeSource UA-789AC blood pressure monitor is equipped with a high speed motor and is paired with the AccuFit™ Extra Large cuff that fits arms ranging from 16.5 - 23.6 inches (42 - 60 cm). 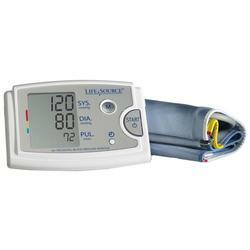 The LifeSource UA-789AC home blood pressure monitor accommodates consumers with larger sized arms. Never before offered in home monitoring, A&D introduces the extra large cuff to the retail market. The cuff is coupled with a high speed motor for a fast and comfortable reading. The LifeSource UA-789 digital blood pressure monitor is also equipped with Irregular Heartbeat detection, which provides blood pressure and pulse rate measurements even when an Irregular Heartbeat occurs, and HeartWise™ Technology which measures blood pressure on inflation while filtering out ambient noise on deflation. With an extra large display, large buttons for easy operation and an AC Power Adapter, this monitor offers speed, reliability and convenience to the home user. observer using the cuff/stethoscope auscultation method within the limits prescribed by the American National Standards Institute (ANSI/AAMI SP10) for electronic sphygmomanometers. Manufactured by an ISO 9001 and ISO 13485 registered company. Engineered in Japan. Made in China. Extra large (for arms 16.5"-23.6" [42-60cm]) cuff for LifeSource blood pressure monitor UA-789AC only..